Creative Commons image by Andrei! When you look at the history of gaming, a lot of emphasis is placed on console and computer games. However, handheld gaming was incredibly influential in increasing awareness of video gaming overall, with Gameboy and other systems racing making gaming on the go a popular pastime. While handheld gaming is getting eclipsed by mobile gaming these days, throughout gaming history it’s been a significant player. The first widely known handheld game came in 1977. 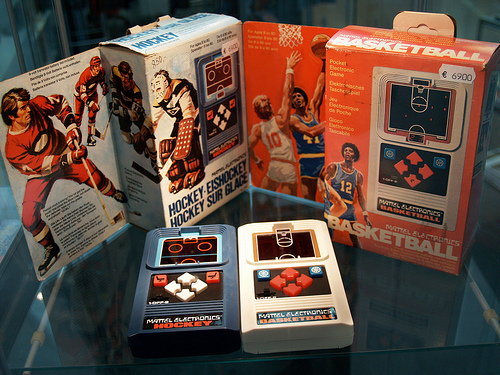 Mattel produced a line of LED handheld games in order to capitalize on the arcade boom. These single game devices included Football, Basketball, and Sub Chase, according to Geek.com. It wasn’t until two years later that game cartridges came to portable systems, thanks to the Milton Bradley Microvision. It had major technical issues that stopped it from gaining a lot of traction, however. Nintendo got in on the portable gaming craze in 1980 with the Game and Watch series. Not only did it function as a single game system, it also provided watch functionality (thus the name). By 1989, portable gaming really came into its own. That’s when Nintendo launched the Game Boy, which took the world by storm. It came with a Tetris bundle that instantly made it a hit, and had a low price tag compared to other systems of the day. It remains the single most successful video game console in history. Sega Game Gear came out a year later and upped the ante with a color screen. However, it never got the same amount of traction that the Gameboy did. Sega tried again in 1995 with the Nomad, a portable version of the Genesis, but technical issues hampered it. Nintendo revised the Gameboy several times over the years, in 1998, 2001, 2003, and 2005. The various Nintendo DS versions and the PSP Vita have seen declining sales as mobile gaming rises in popularity. Connecting your DS or PSP to the online network and community is as simple as turning on wireless Internet for laptop computers. Just enter in the network information to gain access. The convenience of gaming on your phone is hard to pass up, since it’s easier to carry one device to make calls and game, instead of two devices for the same functionality. According to Top Tech Tune, many people are turning to mobile gaming due to the price point of the games and the ease of accessibility. Handheld gaming consoles are still worthwhile for in-depth, unique games that need the hardware support. The DS and Vita are both advanced systems that push the limits of the hardware, showing what these platforms are capable of. The handheld market has seen some truly spectacular failures and bizarre entrants into the field compared to other gaming history segments. According to MoDojo, one of the worst ideas in handheld gaming history were the screen magnifier accessories released for various handhelds over the years. The bombed spectacularly. ← Competition: Win Lost Girl – The Complete 2nd Season On DVD!